I discovered this bottle of TreeTop Orange Juice on my desk. Well, not really discovered - I always knew it was there, but I just didn't really look at it too much. I picked it up sometime in the Winter of 2004 during a conference at a local hotel. Nowhere on the packaging does it say "Refrigerate", so I didn't. The first month, I meant to drink it, but after that I didn't know if it was good anymore. Now that it's October, a coworker of mine said I should call them and find out if it's still good to drink. That's exactly what I did. When I called the number I was put through to the voicemail of a woman named Jenny Bailey. I left a message saying that I had a 10 oz. plastic bottle of orange juice and would like to know if I could still drink it. She called me back the next day, but I was not at my desk when the call came through. She left a message stating that if I could provide her with the lot number printed on the shoulder of the bottle, then she could tell me when the shelf life expired. Two days later, I remembered to call the 800 number again and this time I got Sonya who looked up the lot number and informed me that my orange juice was packaged on November 10, 2003. 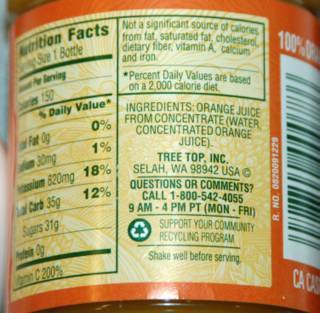 The shelf life on the TreeTop orange juice in plastic bottles is six months, she explained. She suspected (correctly) that the orange juice had started to turn brown, but went on to assure me that it was perfectly safe for me to open it and take a sip to test the flavor. I declined. 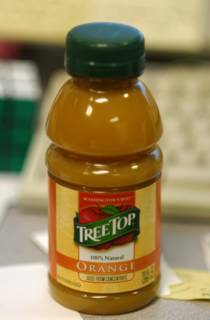 According to Sonya from TreeTop, the orange juice's shelf life is determined by how long the juice will keep it's fresh look and flavor. 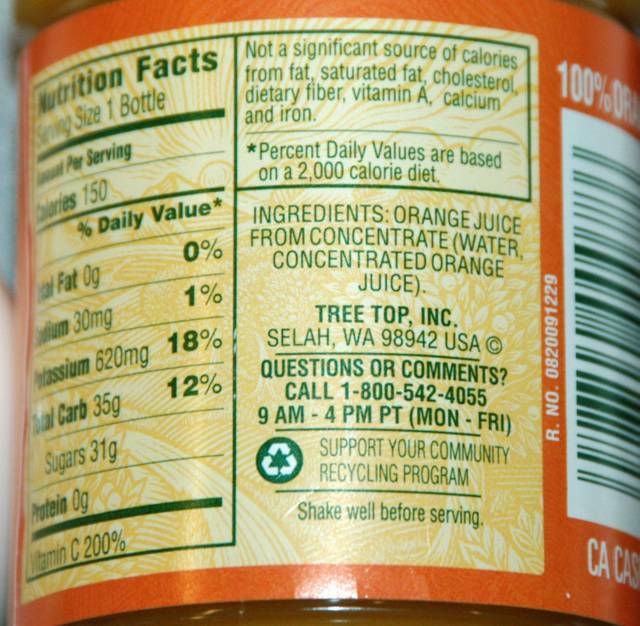 TreeTop claims six months for their orange juice because in their studies after six months the orange juice begins to change colors due to oxidation (not bacteria cultures). The orange juice is perfectly safe to drink due to the pasteurization process, but after it changes color, it loses a great deal of its flavor. Sonya also told me that there is probably no nutritional content in my beverage anymore. Since my curiosity was piqued, I asked if refrigerating the orange juice would have been a smart thing to do. She said that refrigerating the orange juice would definitely prolong its shelf life. Since my bottle was prepared for unrefrigerated storage, placing it in refrigeration would probably extend its life for much more than a year. Surely, had I refrigerated, the beverage would look and taste much as it would have in February when it entered my possession. Sonya also mentioned that once an orange juice product is opened, it should be stored in the refrigerator for no more than a week before being finished or disposed of. Now I'm just contemplating whether or not I should taste this brown juice. C'mon taste it! Pretend you're in your third year of engineering living with a couple other guys in an apartment. You know you'd do it then. I would. Since you've got this bottle from the Winter of 2004, I assume you're back from the future? I see all signs of Engineering: a well-tweaked blog; everything except peekaboo commenting. Taste! Taste! Taste! Enquiring minds want to know. Interesting post though. I find food shelf-life is an issue that isn't discussed often. Sell by dates often seem relative and I've kind of always assumed that in certain cases, they're bull. That perhaps they're just there to encourage you to buy more frequently. That's not to say that they'll taste great, clearly food past it's epiration date is past it's peak, but I'm still suspect in terms of edibility. Then again... food without the dates, like your OJ, is always weird. :| hehe... Stupid lot numbers. How uninformative! I don't know if you should try it... maybe just a little sip, and then sit and wait a few hours and see if it does anything odd to your digestive system. I mean, I really like your blog, and want you to keep writing it, so I'm on the fence about you drinking more than a sip - I don't want anything bad to happen to you. They could always be wrong over at Tree Top, right? Besides, who wants to drink orange juice that's brown and has lots its flavor and nutritional value? If you wanted to do that, you could add food coloring to orange soda and let it go flat. I wonder how much ambient light affects the shelf life. I know that with milk, one of the most important factors after temperature is to keep the actual fluid in the dark (whether by using an opaque carton, or by keeping it in a dark fridge). It would be interesting to repeat the expirament with three bottles: a control on your desk, a bottle in a thick brown paper bag (or other opaque container) and a third in the fridge. I'm willing to bet that light is at least partially responsible for the degredation. I think of Winter of 2004 as starting on Dec. 22, 2003 and ending March 20, 2004. To assign that winter to year 2003 seems "unfair" to 2004 as only 9 days occurred in 2003. After TreeTop informed me that the darkening color was due to oxidation, I knew it had to do with light and wished I had more bottles to do some tests. Oh well. Hmmm, I think that someone needs to do the test. I'm a student with not much more to do. Why not me? I'll see if I can grab 3 at the store and run the test. Hmmm, I'm a busy person, but maybe bored? Not sure yet about that. i once had a carton of apple juice which was left for a similar period of time, took a taste one day..apple cider!! I think what we need to facilitate this is a couple of donations. If I were in school, and we found the old bottle of orange juice. I bet a couple friends could plunk down some dough, and get me to do it. Come on man, what's your price? By a scientist for once. Engineers don't like getting their hands dirty. You don't have to drink the whole thing. Just a taste. Having gone through a similar set of steps with a bottle of minutemaid OJ, including the call to the support line (oddly enough as a sophomore in engineering school)I definitely suggest tasting it. It wont kill you and while the oxidation kills most of the flavor, you will notice some subtleties in the juice that would be otherwise hidden by that pesky orange flavor. But since urs is upopen...i bet it wouldnt taste as weird so try it....or mail it to me and I'll taste it for u...by the time it gets here (Malaysia in South East Asia) it'll probably be blacker than before. LOL!! Vodka and OJ. Drink half the bottle of Vodka and then mix the OJ with the other half. If you would like a volunteer, please let me know, Documented and photgraphed of course. Anything for Science. I've yet to find funding for my own OJ research. I cannot recall the last time we saw any major advances in OrangeJuiceShelfLifeology, I think your on to something Crick. I will definitely take a sip (at least), but I think I will wait longer before I do so. It's not as dark as I would like it yet. It's quite simple. Just drink it. If it still tastes ok, you have another story to post. If it tastes like cr#$%p and you become intoxicated and really sick. Now THEN you have the ultimate story to post. Either way, you (or your blog) win! Chocolate milk is brown and tastes good. Brown orange juice might taste just as good! Try it! Anyway, what I would do..... which I think would be neat, is... it took sooo long to get your orange juice that way. Why not look up a bacteria/yeast/ other microbe that can use that as a food source and then order some, and then feed that stuff to it. Look for one that produces some interesting end products, and maybe use it to fuel something, power your train set or something for really cheap. Then you can start buying predator ones that eat those and produce different end products, and so on. Then maybe somewhere along the way make some really "interesting" tasting bread or alcohol. You can have like 20+ generations (like an army) in like 24 hours. No one person should be expected to go through this alone. It sounds like it wouldn't be too hard to gather a group of people who could each take a small sample of the liquid that was once orange juice. They could record their individual reactions and observe the reactions of the others around them. And if anybody becomes ill, you could also test the theory of sympathetic vomiting! Comon.. what could a little oxidation hurt? Your orange juice seems to have darkened in color. Instread of being a bright #E1950B yours is a brown #955700 that less green and red in proportion to blue. My doubts as to it getting any darker, everything should be broken down by now. I would suggest tasting! Put their pasteurization system to the test. My bet would be that a yeast or two survived and you have a slight case of fermented orange juice or really bland water. You've gone to the trouble to let it turn brown, don't waste the moment by drinking it while no one is around. Wait until you have Health 101 or something. When the prof starts extoling the benefits of Vitamin C, yawn, stretch, burp, then noisily open the bottle and say, "Yes, just what I need, a little fresh OJ and some vitamin C." Tilt your head back and pour. or, wait until you have a friend over for a movie. Make lots of salty popcorn. When they ask for something to drink, say, "Do you like orange juice? It is all I have." Wow seems all engineers are busy in finding it out wether he should taste it or not.Seems you guys have nothing to do :) .Well thats why we never have good engineered products. I am normal and i would suggest you to throw it away and buy a new one :)I am sure you can afford another one? The orange juice is question can be consumed up to 36 months without opening or refrigerating. Believe me... I bought a whole carton of orange juice one day, put it in the store and promptly forgot until one day, 3 years later. It looked... well brown... and the bottom was a darker colour. I gave one bottle to a friend who offered to try it. He said it tasted alright... so I gave the whole carton to him. I never heard from him again. If your ever cursing because your last POS blender breaks down inexplicably, its because all the good engineers died when their natural curiousity overrides their genetic BIG RED DANGER signs. I am sitting at my desk staring at a bottle of orange juice and thought " I left that bottle on my desk overnight after opening it, I should find out whether or not its still good to drink." Well I read this post and decided to drink up! This morning I downed a bottle of orange juice. This glass bottle had been sitting on a coworker's desk for two years. It had been pasteurized, so I was not worried about getting sick, although it had turned brownish. On the label was written the words 'Improved Taste'. They weren't kidding - it was still pretty good. i was getting ready to drink my OJ that expired 11 days ago, until i read the last bit of your post. now i'm scared. i think if i add some vodka, the alcohol will kill off anything nasty. OJ is unlikely to 'go bad' except that it might ferment. Its high acidity makes it fairly safe from bacteria. I tasted (unknowingly) a 6 year old opened (albeit refridgerated) bottle of Pepsi. Needless to say the flavor was completely different then expected. It was similar to carbonated water... perhaps that's what battery acid tastes like? Of course I have been told by some people I use to work with that shelf life or dating things is only for America. They tell me that in their countries nothing ever expires. You see, I am fixing to make some lemon pickle and thinking how the spices that were givin to me to make that are now over 10 years old too. Haven't used them in about 10 years either. Found this web site today and been reading about making mayonnaise, Costco cookware, some test recipes and now old, past shelf life orange juice. Sounds like your juice is not that old, maybe you should take a sip. Mine is in a large juice can, so if I open it, it will have to be finished within a week or perhaps tossed right away. Heard a news broadcast about orange crops not doing so well in California, then noticed the price of oranges went up. Saw a sale on Dole orange juice, looked at the expiry date, it said Feb 22, 2007, so bought two. Consumed one before Feb 22 then started chugging the other on the 22nd. Woke up heaving in the middle of the night and having coughing fits, ears ringing, and started heaving heavy. Cough hurts my chest and feels like it is closing in, the taste in my mouth is awful, painfully dry. Im five months pregnant and when I looked at the bottle again noticed that the expiry date on that container was Dec 24, 2006. Im drinking plenty of milk and sucking on honey, but am worried now due to all the pain and acidicky feeling. My girlfriend told me that's why you should always look. It's been 21 hours now and I feel like a volcano or dragon, and am worried about the baby. Uhm, try calling Dole. The number should be in the carton. Was this refrigerated orange juice or the shelf stable variety? Please don't drink opened orange juice that's old. 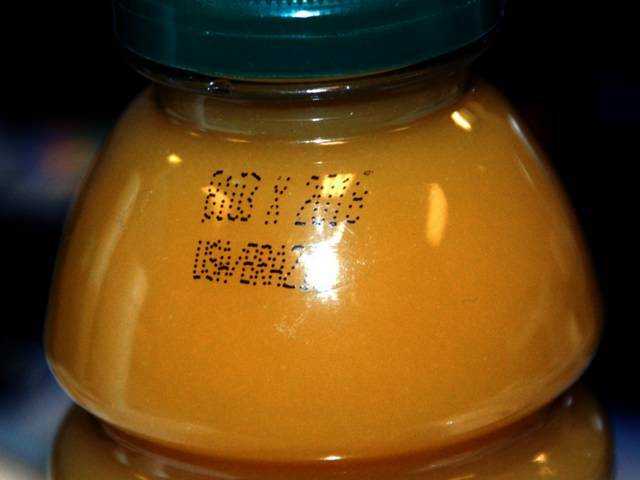 Even if the orange juice is sealed, if it's the refrigerated type (not the shelf stable variety), then you shouldn't drink it past the expiration date. I just downed a half gallon carton of Orange Juice that had a sell by of March 12, 2007- flavorless, but still orange. about 2/3 the way down the page under Frequently Asked Questions About Food Dates and Storage. Re: old orange juice: While doing major yard work on a very hot day, and having skipped lunch which caused blood sugar, i.e., energy, to drop to zero, I drank some Tropicana in plastic bottles that had turned dark after a year unrefrigerated. No ill effects except in my mind worrying about the sweet juice that had little acid to ward off bacteria. Oh sorry, I forgot. The biggest thing I was worried about was how much plastic leached into the juice. I just had 14 day expired OJ for breakfast today because it was still in the Vending Machine and I payed a freaking dollar for it. Welches brand, and only 10oz I think I got jipped. Anyways I found this site looking to see if it was a smart move and it still had its yellow/orange color, but damn did it taste awful. Like drinking orange flavored acid, this stuff was terrible and suffice to say im still tasting it in my mouth. Now maybe it was fine and Welches is just a disgusting brand of OJ. You think if I left a note I could get my dollar back for getting 2 weeks expired Orange Juice? You think if I left a note I could get my dollar back for getting 2 weeks expired Orange Juice? Most vending machines have a telephone number on it that you can call. The times that I've had to call, they've always told me how to get my money back. I don't remember exactly where I got this fact but freshly squeezed orange juice looses 30 of its vitamin C the first five minutes it is exposed to the air and nearly all of it within a half hour. I'm pretty sure I got this from a juicing manual but I can't swear by it. I WILL drink the "not from concentrate" OJ but just knowing that all the vitamin C in there is man-made and added kind of bums me. In a fit of thirst, I drank some orange juice from a tetrabrick box that had turned an unappetizing brown. It tasted ok but now this acid-y taste keeps burping up. Otherwise, no ill effects. i just bought some orange juice from my local liquor store. After mixing it with a half pint of shmirnof blue label i noticed that the expiration date was more than six months ago. I thought about it then said screw it, its 2am and all liquor stores are closed so i drank it. Now i am worrying about whether or not I will become deathly ill so I looked it up on the internet and discovered this blog. I feel fine right now, but i am very drunk. the orange juice was dark brown and looked nothing like orange juice should. I will write another response tomaroww depending apon my condition. If none of you hear back from me you should assume that I have died. Never ran into bad OJ. Shoulda known. Opened up the container (it was a frozen sort, mixed with water eventually) about 2 inches left. I opened it up and it inhaled air. Not a good sign, but smelled it and smelled fine. Poured a glass and gave a good swig. Might as well of drunk some vodka. It would have tasted better. Stung all the way down. 40 minutes later I still taste the aftertaste. Don't think I'm going to bed just yet. Maybe I should just drink half a bottle of newmans own salad dressing. Pull a Carlin.. Ack it got on me by accident aaaaahhhhhhh...!!!!! Turning an O.J. into a B.J.? Sounds like a pretty darn good deal to me. Ok so now I know about the bottled stuff but now I have another type of inquiry. My girlfriend took a can (carboard type) of frozen orange juice concentrate out of the freezer and put it into the fridge so it'd be easier to mix. Now about 3 months later it's still in the fridge and I'm wondering if it would be safe to mix with water and guzzle down. I'm at home surrounded by 4 ft. of snow, have a wicked O.J. craving, and the only thing I have is this! What should I do??? Subject: "Old Orange Juice, Yummy!" I always drink my 'bad' (freshly squeezed, bottled at the store, and then HURLED into the dumpster a day later)...orange juice. It's great. Frmented, and if I want to make it 'healthy' I throw in some psyllium seed powder. To sweeten --admittedly it IS sourish, fizzy--i throw in either sugar or some whey protein powder. I am convinced that it's STRICTLY for business reasons, rather than health ones, that food has sell-by dates. For seven years I've operated the Salivation Army frm the local dumpster here in NorCal. Never once been sick. 2. sits on a shelf in the garage for a year - no refrigeration and not being opened - turns brownish and the heavier part of the juice settles to the bottom - looks yucky. After opening, it tastes less like orange juice - just close your eyes and gulp. It's still fine after opening, for a few weeks, without any fermentation. Not very pleasant looking and not real sweet. Just change the way you think about it and it'll be fine - mix with other juices to tone it down. 3. Several weeks have passed, and you'll know when fermentation has occurred, because when you open the top, you hear the fzzzzzzzzzz sound. Tastes like beer. Since I'm not a beer drinker and find it disgusting, am trying to find a recipe that calls for beer or some fermented or fizzy drink in the baking - like a cake or muffin. It will serve the purpose of some liquid and provide some fermentation for the batter, but obviously has no nutritional value at this point. It' s just a matter of trying to make it useful. I'm all for that! I don't know if the fizzzzz is strong enough to clean out a toilet bowl. Haven't tried that yet. I didn't have an ice pack for my daughter's lunch bag, so I used a frozen orange juice instead. Needless to say, she never emptied her lunch bag when she returned home from school, right before Christmas. The frozen orange juice container consequently melted, and I took it out of her bag this morning (almost two weeks later). I left the container in the sink, meaning to throw it away when I returned home from work. When I got home today, the orange juice container was gone, and I didn't think much about it, until my daughter tasted the orange juice that was in the pitcher, and asked why it tasted so "funky". My son had made the juice when he got up this morning, thinking that I had left the juice in the sink to thaw out...He had about 16 ounces of the old juice, and he seems to be no worse for it, yet. Only label I believe in is the one that says what the product is. There are so many products whose quality only degrade and do not present a food safety issue. Most of these foods end up at your Food Bank. I ran a summer food program, never getting any kid sick, on said food. spent night at my brother and sisterin-laws. got up for a swig of oj cause I was so.ooooo thirsty. chug-a-lug , and came up for air when I realized it was so salty! It may say OJ on the bottle but it doesn't mean it is OJ!!! For the second time recently, I mixed up some frozen OJ and put it in an old OJ bottle with an air tight cap. I drink the juice from the bottle and this is why it might have fermented?? After mayby a week or so, I open the juice and there is a whoosh or fizz. The OJ has fermented and has a tang to it. If I shake the juice it foams. Not a bad taste actually, sort of like a mimosa. Subject: I drank OJ 7 months past the "best by" date !!! I had a previously opened, refrigerated bottle of Indian River Select Valencia OJ ([u:eddfbfdacf]NOT[/u:eddfbfdacf] from concentrate, pasteurized) in my refrigerator. It was still orange in color. I shook it up before I poured the last 12 oz into a glass and drank all of it. It tasted fine, I didn't notice any loss of flavor. The "best by" date was 12/17/09, so that makes it over 7 months past the "best by" date !!! I saw at the end of the original article that the lady at the OJ company suggested that once you open OJ, it should be refrigerated and if not consumed, thrown away no longer than a week later. REMEMBER, they're in the business of selling you MORE OJ !!! They don't care if you keep throwing away your unfinished OJ just because it has been open more than a week, they want to sell you "[u:eddfbfdacf]fresh[/u:eddfbfdacf]" OJ EVERY week, NOT when you finish drinking your "[u:eddfbfdacf]old[/u:eddfbfdacf]" OJ. I put vodka in some orange juice and left it in my fridge for about a month ive been told that i shouldnt drink it coz the orange juice would have gone bad but because theres vodka in it then it would last longer right? Subject: Did you ever drink that juice? Subject: Re: Did you ever drink that juice? I would love an update post. The time has come, be like Nike and just do it! Just found 2 year old boxed orange juice in my kitchen and poured it in the sink to find what looks like mouse crap and oats in a brown liquid.How they got in there I do not know but there was oats beside it.The box was completely un touched apart from a brok n seal from years ago when I meant to drink it how the (what I'm assuming is) mouse crapgot in there iI will never know but at least your experience wasnt as bad as mine. my brown oj, unopened & refrigerated, half gallon cardboard container, expired in July 2015 (now 4/16). It tastes like just like oj. I think I'll quickly drink the rest.